Massey master’s student Hayden Wilson with Massey’s artificially intelligent farm assistant. 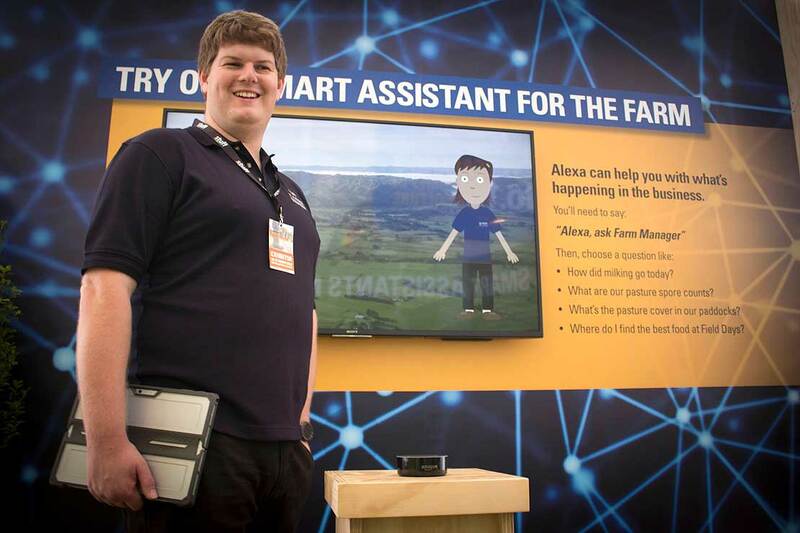 Massey University is living the “future of farming" theme at National Fieldays this year with robots, future foods, an artificially intelligent farm assistant, and a focus on health and wellbeing on show this week. This is the University’s first partnering with the New Zealand National Fieldays Society, owner of the iconic Fieldays event, and its second year partnering with the Health and Wellbeing programme. Massey’s stand in the main pavilion will showcase an artificially intelligent farm assistant. The screen-based prototype will allow people visiting the stand to ask an avatar farm-related questions. Voice recognition technology and pre-loaded farm data enables the avatar to quickly analyse the question and put forward answers and solutions. The stand will also feature plant-based proteins, including soy patties that look and taste like meat, and bread made from nut and cricket flour. Massey’s College of Health have a stand in the Health Hub, where they will be asking crowds to play a spin-the-wheel style health promotion game designed to engage people in conversations about health and wellbeing. It covers different health topics, including nutrition, exercise and social life, and aims to expand people’s knowledge so they can better look after themselves and others. Two Massey dietetic students will be conducting a ‘sugary drink’ activity, where people can try different drinks, like flavoured waters, to find out more about sugar in drinks and the alternatives. Massey know-how will also feature on other sites around the 114-hectare site. Over on the C-Dax stand (site F25) the C-Dax Pasture Meter Robot will be on show. The game-changing robot has been developed in conjunction with graduates from Massey University. Representing the future of smart farming, the robot uses the proven Pasture Meter technology to measure pasture autonomously allowing for its optimum use while saving labour costs. It will be accompanied by Massey mechatronics graduates Mitchell Hampton and Tim Sutcliffe, who are now working with C-Dax on the next stage of field trials. It has been entered in the Fieldays Innovation Awards. The Massey Agritech Research Centre will also be on show at an event in Hamilton, with the centre’s professor of robotics Johan Potgieter giving a talk on the future of farming. The talk and networking event will be hosted by Massey’s Alumni Office on Thursday June 14 from 5.30pm at The Verandah.